Pâte de cristal technique is rare and ancient. This technique dates back to 5000 B.C. (pieces have been found in pharaohs’ tombs). Forgotten, Daum rediscovered it in 1900, then further developed in 1968. The process is extremely delicate to master. The pieces produced by the melting of fragments of crystal within a mould have a texture, substance and a softness of contours that can not be obtained with blown glass. Pâte de cristal is a Daum speciality, sometimes copied but never equalled ; a precious material that gives pieces a sculptural dimension and which has been refined unceasingly. Pâte de cristal has the quality of giving translucency to the forms it reproduces. The brilliance of this material, the intensity of coulours and the myriad subtile shades all contribute to its singularity. Pâte de cristal is in fact a paste made of crystal with a 30% lead content. Pâte de cristal originates from specially produced batches of crystal melted in crucibles. Several factors have a bearing on the final coulour : the granule size of the crystal fragments, the proportions in the batch, the chemical reaction between some materials and metals, the rate of increase and decrease in temperature within kilns. Starting from sketches, the sculptor creates an initial model in clay. The volume, details and expressions are worked to perfection. Once the sculpture is finished, it is used to generate a negative mold in elastomer. The hot wax is poured into the hollow mold, emptied of the original sculpture. Once the wax sets, the wax sculpture is removed from its mold. The wax sculpture can be hiseled and worked to obtain a perfect reproduction, identical to the original. The wax model is then immersed and encased in heat-resistant plaster. The block of plaster containing the wax model is placed in an oven. Under the action of the heat, the wax melts and runs out of the plaster block through specially-created drain holes. The wax is said to be « lost ». Once all the wax run out of the plaster block, the hollow part of the mold thus created is carefully filled with fragments of crystal of different colors and different sizes (called groisil). Once cooled, the plaster mold is carefully broken, to reveal the sculpture in pâte-de-cristal. There remain a number of finishing operations to be carried out before proceeding with the quality control inspections to ensure the quality of the materials and the distribution of the colors. After the finishing operations, control inspections are made to ensure the quality of the materials and the distribution of colors. 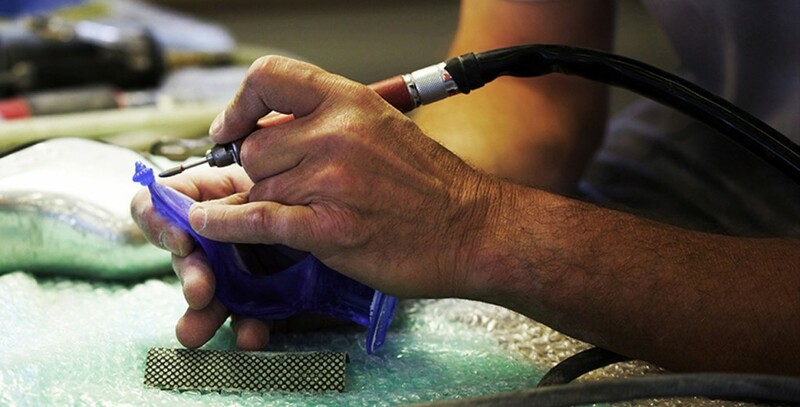 The piece is then ready to receive the final touch: the Daum signature. The entire process is carried out for each new piece. Each piece is unique. You can admire the exceptional color blend and the sculpture details finely hand-crafted. This unique know-how gives birth to exceptional pieces. From the Ecole de Nancy, from l’Art Nouveau to Arts Décoratifs, from Majorelle to Dali, Arman and Hilton McConnico, Daum has not missed any of the magic rendez-vous of the artistic creation and modern savoir-faire, which has always rende the alliance of art ans art craft. Few brands have worked with as many artists: within more than 130 years, more than 350 exceptional signatures have constituted a heritage beyond compare, a unique collection.